Born in the bountiful farmland of Thach That district (Hanoi), the trees, fields and farming always seemed to be attractive in the mind of a young girl named Nguyen Thi Lan. Graduating from high school in 1990, while many of her friends decided to select economic, cultural and law majors, Nguyen Thi Lan was determined to enroll in Veterinary Medicine of University of Agriculture 1 (now called Vietnam National University of Agriculture), to satisfy her thirst for studying and learning her favorite field. Here, with the guidance and inspiration from her teachers, her spirit was lightened up with creativity and passion for scientific research. After graduating, she was accepted as lecturer at the Department of Veterinary Medicine. The more she taught, the more she realized that researching is an important factor contributing to the improving the quality of training. Therefore, she has been constantly innovating her teaching methods; keeping her involvement scientific research to fire up the creativity, activeness and excitement in students. Prof. Dr. Nguyen Thi Lan (second from the left) is exchanging and sharing experiences with journalists. After thoroughly thinking, with the support from her family, friends and colleagues, Nguyen Thi Lan finally set out to pursue her post graduate in Japan, the Land of the Rising Sun, where she did research and thesis on the vaccinate and disease prevention in. “In another country, everything seems strange. The more I missed home and my kids, the more I was determined to take full advantage of every second, every opportunity to quickly adapt and learn as much as possible. Sometimes, I spent weeks and months burying my head in work, but sometimes the results were not as good as expected, I must start to do it again. And so I just immersed myself with each research result” – Mrs. Nguyen Thi Lan said. In 2003, Prof. Dr. Nguyen Thi Lan returned with an outstanding degree in hand, eagerly embarked on her work and longed to bring all of her knowledge to apply to reality of the country. But difficulties just kept coming: the lack of standard equipment and laboratories, the shortage of veterinary studying subjects and limited researching budgets. Many researchers, who found hard to apply research proposals for funding, gave up and swatch from researching to teaching only. However, being steadfast to her thought that “science and practicality must be associated” and “scientific researching is the vitality of the university”, Prof. Dr. Nguyen Thi Lan embarked in writing and sending research proposals to many places. In 2008, Porcine reproductive and respiratory syndrome (PRRS) broke out on a large scale throughout the country, posing challenges for researchers to find ways to prevent and treat this disease. Prof. Dr. Nguyen Thi Lan had proposed a study in find ways to diagnose, early detect PRRS and was lucky enough to have it approved by the Ministry of Science and Technology. She was then assigned as the leader of this project. After 2 years of implementation, the research team collected 986 PRRS samples, selected the line Marc-45 and isolating 20 PRRS virus strains, 6 of which had high efficacy, were biologically and genetically stable as raw materials for producing diagnosis kits and serving other in-depth studies of PRRS. 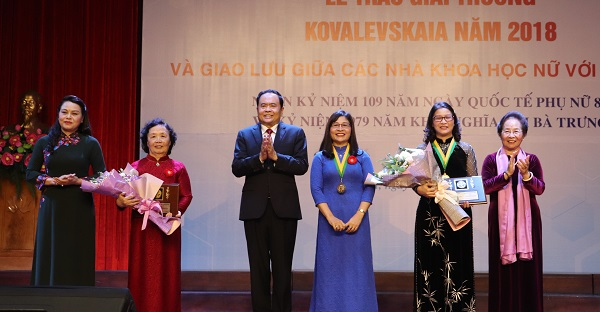 Prof. Dr. Nguyen Thi Lan, Vietnam National University of Agriculture (second from the right) receives the 2018 Kovalesvskaia Award. “From the success of this research, we have formed an effective process through advanced research groups, changing the researching methods at the university. Till now, the university has 49 advanced research groups in the fields of cultivation, farming, veterinary, aquaculture, electro-mechanics, economy-policy, etc., which involve many lecturers and students. 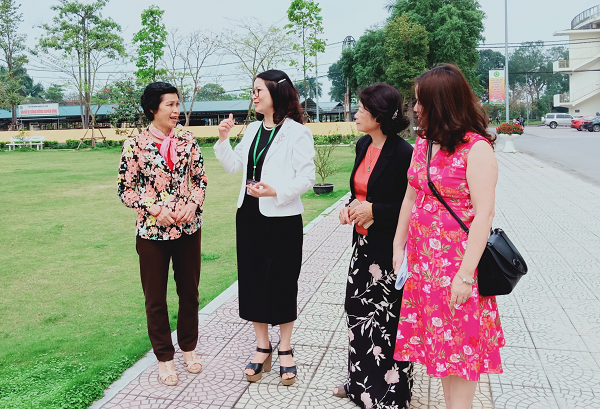 Since then, the movement has been flourished and motivated by generations of teachers and students” – Prof. Dr. Nguyen Thi Lan was happy to share. Most recently, Prof. Dr. Nguyen Thi Lan and other scientists at the VNUA have detected the African swine fever virus in some northern provinces at the beginning of 2019. She and her colleagues have monitored and successfully controlled the spreading of said virus, created an important breakthrough in research and diagnosis, searched for vaccines preventing such a dangerous disease to the Vietnamese farming industry. With the flourishing results in the scientific research movement in recent years, VNUA has affirmed its name and brand as a reliable address for high quality human resource training facility. At the same time, it has also become a preferred address for many units, businesses, localities and farmers to trust and order research and development of key products and advice on methods to prevent diseases on plants and cattle. VNUA currently ranks the 5th in the university rankings nationwide in 2019, went up 18 ranks in the international university rankings in 2018. She said that the Kovalevskaia Award is really pervasive, especially in university, the “flowers” of Kovalevskaia are like shining examples, fueling generations of students striving to study and research. Prof. Dr. Nguyen Thi Lan also shared: Despite taking on many responsibilities, from the “leader” of VNUA, to a Hanoi city parliamentary delegate, a Chairman of the Asian Veterinary Association, she would still invest time and passion into pushing the scientific researching movement event stronger, especially within the VNUA students. Currently, she is actively involved in developing strategy and research orientation for advanced research groups on animal vaccines. In addition, she directed the establishment of other groups in many other areas such as land management, smart agriculture, organic agriculture, mechanics, food process engineering… with the desire to create products that are useful to society and can be connected to the international community.